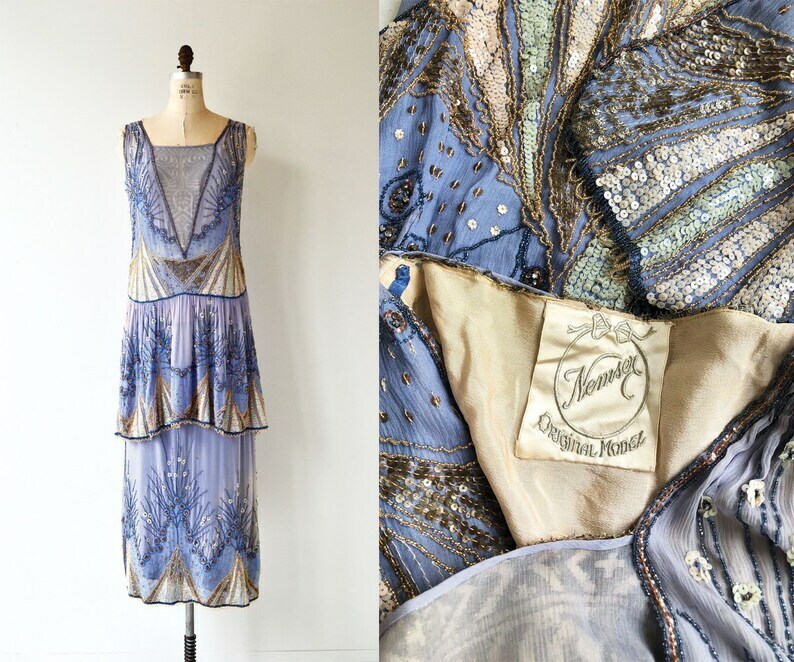 Extremely rare early 1920s Sadie Nemser silk chiffon evening dress in periwinkle, ivory and very pale grey with extensive sequin & beadwork. There are very few of these dresses left in the world, and most of them are owned by museums and private collectors. Sadie Nemser was an acclaimed designer who created Grace Coolidge's 1923 inaugural gown (check out link below) and sold her highly sought-after gowns in upscale New York City departments stores. Her business was family owned and family members all specialized in different areas of design work; her exquisite gowns are best known for intricate beading and fine embroidery. Ms. Nemser was a front runner in cubist dress design. In 1928, Mr. Nemser was awarded the "French National Legion of Honor" for his and Sadie's endeavors (being premier delegates of the "Congress of Garment Retailers of America") for concordance between French and American garment industries.